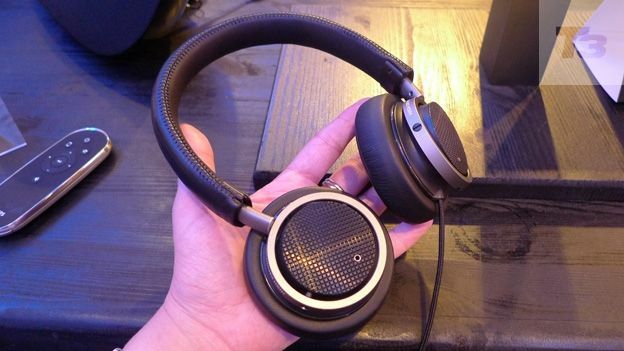 The Phililps Fidelio M1 is the second pair of headphones from the Dutch manufacturer's 2012 range, with the Philips Fidelio L1s already scooping a five-star rating on T3.com. While the previous cans sported and semi-open back around-ear design, the L1s take the on-ear route. Our list of the best headphones features plenty of on-ear designs, not least the high-end B&S P3s along with the slightly more affordable Urbanears Plattan and the TDK ST-700. Like the L1s, the M1s have a slightly retro look to them, courtesy of a stylish speaker grill and angular brushed metal destails, along with the understated black leather headband. While the build quality feels sturdy enough, we'll be putting the headphones through their paces once we get a full review sample at T3 Towers. Comfort is one of the biggest hurdles for companies making on-ear headphone designs and Philips has taken this into account with M1s. The fine leather earpads feature memory foam along with a fabric covering in the centre, with the aim being to create a decent seal without the cans feeling too tight on your bonce. We gave they a quick try and they certainly felt comfy although the real test will be how they feel after an hour or two. The M1s feautre the same ridged 40mm neodymium drivers that appear in the L1s, but they've been tweaked to offer good audio performance in the smaller earcup of the M1. Many aspects of the L1 impressed us, not least the audio quality so we have high hopes for the M1. We busted out the iPod to give the L1s a quick test in the limited time that we had with them and we were impressed with the results on a couple of our favourite test tracks. Obviously this is something that we'll be delving into in more detail in our full review. The Philips Fidelio M1s stand out from the crowd with their chic design that sports a hint of retro while retaining the look of a premium product. In our limited time with the headphones, we certainly liked the look and feel of them and the audio performance was also strong. Stay tuned for a more detailed review.